I received an Blackmagic design URSA PL mount camera late last week. Although I’ve been involved in other behind the scenes testing at BM, this was the first chance I’ve had to take a camera out and do my own thing. I start shooting “Hiding”, a new ABC TV series tomorrow morning so I’ve been flat out getting ready for “Hiding”, but I managed to sneak out early this morning before sunrise to the wonderful Bronte beach. I knew the weather would probably be good, so I took myself, the Ursa and a Panavision supplied Cooke 25-250 MK3 T 3.7 zoom down to shoot the sunrise. This clip was shot over a period of about 90 mins. I filled three of my four 128Gb SanDisk CFast 2.0 cards and did it on two Vlock batteries. Many of the shots were done before sunrise. Pretty impressive for 400 ISO @ T4 at that frame rate. All shots are ISO 400, 60 FPS at 4K UHD (3840 x 2160) ProRes HQ except for just one which was 24 FPS, the shot of the sun actually rising in shot. One thing to note. The Cooke 25-250 zoom is a vintage lens that’s over 30 years old. It’s quite soft on the edges even when the centre is sharp. You’ll also see a lot of chromatic aberration. It’s hardly what you’d call a modern lens design. But I like it for it’s personality. I used the True ND 9 and 1.5 once the sun was up. Vimeo doesn’t do the original ProRes files justice either. They are gorgeous. I should add, single node grade in Resolve, no NR and I had to fix two shots with black sun. This entry was posted in Black Magic Cinema Camera, Equipment. Bookmark the permalink. very nice! how did you like the ergonomics of the camera? It is my luck, that I googled BlackMagic Ursa test footage some minutes ago and found this post! Thank you for footage, it is great to see that people started receiving those devices! Please, share your opinion on monitor, on battery life, on everything! And if possible, tell us about sensor! Does it has fixed pattern noise? I would like to know more, because this one looks magic… just magic! So exciting!!! Thank you for this test. So i have to ask, I see the sun clearly in the footatge, yet no sun spot. Does this mean that they fixed it?! No there were two shots that had to be fixed by me. Very awesome. Owning three Blackmagic cameras atm, I just realized I have to purchase this camera along with some proper cinema lenses. It looks just phenomenal. How’s the battery life? I just participated in a shoot with an Alexa plus, where we had to change out 190Wh V-mount batteries at least once an hour. Obviously on the BMCC you get far more but is it comparable more to the Alexa or to the BMPC4k or BMCC? 3 x 128 Gb for 90 Minutes only ? … seems 4K is more storage-consoming than what we thought ! well then… that makes it even “worse” hehehe. So, 384GBs will result in 45 minutes of footage, give or take (considering the 880Mbps 422 ProRes HQ in UHD), isn’t it? Really awesome footage! Looks amazing. I can’t wait to see more. Especially would love to see 4K RAW footage in 60 fps. I’m curious to hear your thoughts on the CFast 2.0 Media and the recording times; What are the recording times actually like with UHD ProRes (HQ) and RAW in regular 24 fps vs 60 fps? How fast can you switch out the cards and drop them? This vid ought to be renamed “Come to Australia” and used by the Australian Tourist Board. Some gorgeous shots. Also, do you have any thoughts on the Sony A7s? I imagine it’s not on your radar but was curious nonetheless. It sounds interesting, but I haven’t been totally overwhelmed by it from what I’ve seen. What were the capacity limits of the 128GB cards and does this camera go above 800 ASA? Thanks for taking the time to do this, John. Really good stuff, even without being able to see it in UHD. That lens is pretty massive. Looks great though. Any chance we can download the original file? Absolutely stunning. Your preferences are??? RED EPIC or URSA? ALEXA or URSA? (In terms of quality not workflow) Excluding the dynamic range of the alexa of course. I’m curious to know your thoughts since the URSA looks like it may compete in skin colors and color rendition with the alexa? Not sure until we see some tests, but you’re the maestro! They’re all different tools good at different jobs. I like them all for different things. Look to the current 4K if you want an idea of skin tones. Bronte Delight! Place to be. Well done. Thanks for sharing. Thanks for sharing, JB! Very nice shooting of a beautiful place. Cheers! Hi John.. It’s true that, although, Vimeo is a great site for HD hosting. That the subtle details can get eaten up with the online compression.. I noticed that there was some chroma aliasing in the some of the water shots.. Are these artifacts present in the original footage? The advantage of youtube being that you can at least upload/view the original 4k file and get a sense of what it’s capable of? Thanks really great!! what is the name of the song? Hey mate, thanks for posting, looks nice. Do you plan to post any 24/25 fps narrative style footage? Skin tones, interiors etc, your pool table footage a couple of years was something to get excite over. I could but honestly it’s basically the same as the current 4K camera. I can’t release most of what I’ve done as it’s embargoed. Okay great, thanks for clearing that up. Very impressive, John. Thank you for sharing. 60p looks great. Glad BMD is finally doing HFR. I am tempted and terrified by this camera. Doing RAW with it can be a pain, CF2.0 are very expensive and small in size. Knowing BMD rate in producing new models I fear that it will be usable when it will be old! Everyone is terrified of obsolescence. The original BMCC camera is now what…three years old ? There STILL isn’t another camera that comes close to touching it for dynamic range, codec options, being uncompressed and for it’s bit depth. Can you name one ? They just recently released a new firmware update that added features that were never even part of the original feature set. URSA is designed to have an even longer life. It has interchangeable sensors and a lot of CPU / processing overhead for higher resolution and higher frame rates. Yeah they make new models, but they don’t replace previous models. Look at all their cameras. They are unique and positioned in a way that doesn’t “replace” the other models. I do partly agree with you. I have the original BMCC and it rocks (only thing missing for me is 60fp for some slowmo), I love picture quality, despite some moirè and rolling shutter. I bought Pocket camera too, but.. not same DR, I clearly notice it. Looking for some 60P capable camera I stumbled on the Studio, but having RAW external recording at 60P makes it almost expensive as URSA, which has much more features. But.. how can you handle the URSA on a set, swapping cards every five minutes? It seems usable only in studio for the next year or so..
Well, you’re kind of complaining about what is really a feature…that it does 4K 60P ProRes…because it uses so much data and requires a media platform that will future proof it for years…. You can get really nice 1920 ProRes out of it at 60P if you want as well, and higher frames are still in the works. I’m pretty sure external recorders aren’t far away either. If 6) p is what you want but not the high data rate then perhaps consider some other less expensive and more compressed options ? 60P is not the only thing I’m looking for, but definetly what I would like to have to complete my camera set (BMCC + POCKET) at current quality level. I still hope they will make a Hyperdeck which records 60P Prores, pairing it with the Studio camera would be a “cheap” solution. I wrote to BMD on the forum about it, but no reply.. Anyway, thanks for the beautyful shots, they really show some great potential from this camera! I think everyone is wishing for that Hyperdeck. Someone’s going to have to do something. There’s still the CION that has 120 FPS but nothing to record it with as well. I’m also hoping Convergent Design can do something. What about the 4K recorder from Atomos? It’s not cheap, but also provides a beautiful 7″ HD screen, and uses SSDs or HDs for recording to. Hi Toby. Hope you’re traveling well. I find the noise pretty bad at 800 without heavy NR. It’s really only good for me at 400. All of this was shot at 400 mind. One of the downsides of a global shutter is lower sensitivity. Thanks John. I didn’t know that about the global shutter – makes sense. So I guess it’s difficult to recommend the camera for genuine low light situations. Does look nice though. 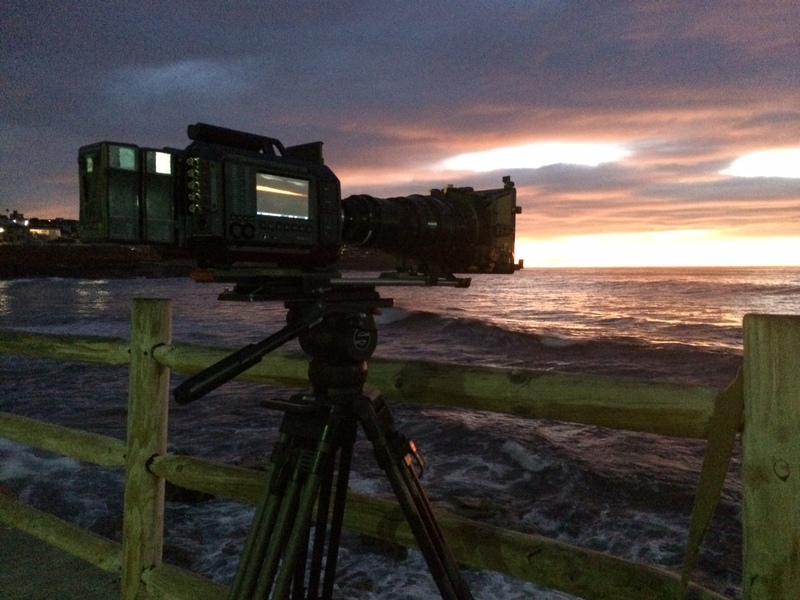 Pingback: Very First Breathtaking Blackmagic URSA Sunrise Footage of Bronte Beach | planet5D DSLR video news and more! Hey John, a couple years ago you did a test on a beach of a Blackmagic camera and had a song with a man and woman singing. I had bookmarked the song but lost the bookmark with a new computer. It was an Australian duo. Very catchy guitar driven song. I can no longer find the vid on your Vimeo channel. Do you remember the name of the song/band? You’ve got great taste in music. Also, just wanna let you know my favorite tests you do are the lens tests. It’s cool getting to see how the various cine lenses capture an image. I know you say most people find them boring but I wanted to let you know there are at least a few of us who really dig ’em! Thanks again for all you do, for sharing your knowledge. Regarding the weight, can you make any comment about how usable you feel the camera would be in ENG and EFP situations? Is it a camera that could be used to cover documentary and events for example? With a lightweight Canon zoom maybe it could be manageable? But what about with a Fujinon Cabrio attached? It’s pretty heavy. While it is very well balanced I’m not sure you’d want to have it on your shoulder all day long. It’s very nice with a mid weight zoom on but you’re still carrying a lot of weight, even though it’s on your shoulder instead of being “lifted” by your arms. Good work John. I’m a believer in BM. I Love the BMCC and the BMPC4k. I own them both as they work well together based on what shooting conditions you are in. This URSA is awesome. I agree with the future proofing as sensors improve you can just swap it out instead of having to buy a whole new camera. The only question I have is the batter life. What power solution did you use and how long did it last? This will help me put the proposal together for what exactly is needed to make this baby functional. All in all the camera is $6000 and with CFast at $1200 a pop, I am thinking $10,000 to $12,000 for a basic start up without lenses. My BMPCC suffers HORRIBLE(and I mean worst I have ever seen) IR pollution when using more than .6ND. Did you experience this or use any IR cut filters or Hot mirrors? It’s normal for any camera to need IR filtration when using NDs. Ursa is no different. I like using the “TRUE NDs”. My M8 is much worse than the ursa for IR pollution. The thing is they did it by choice. Every manufacture makes that choice. But if you’re too aggressive you also overlap into visible light that you want. It’s not like there’s a hard cut off. BM cameras HAVE an IR filter. It’s just that with a ND that you might choose to have more. Some filters cut more than others. Most NDs also aren’t even neutral. Sort of off topic, but still in the black magic camera arena. I am testing a BMD STudio Camera for the Motion Conference here in Albuquerque. I need some direction on its quirks any links or pointers would be much appreciated. Sorry if this is not your area, just know that you have great insight into BMD. Products. To be honest I haven’t spent much time on the studio camera. Thanks John, just going to work it out, got two days to ease into it. let us know your impressions laurence, I’m really interested in it, there’s almost no review about Studio Camera. One, I love the simplicity of the camera, it is a work in progress though. Two, as we all know, fast glass rules and with this camera, it is a must. In our theater setting, the house lights are not enough, so we are going to test with a MFT 45 mm prime tomorrow. As to the limited color temps, I have no problem with it. It seems to match very close to our SONY EX-1 settings. As of right now, what might seem soft on the display seems to be sharp when we run through the hyperdeck and the tri-caster setup. I can see that in a year this has the potential to allow a lot of small theater, clubs, meeting places to have a very capable video capture system for low cost. It has lots of room for improvement at BMD to implement. We have not had the chance to run fiber / light pipe for anything. Straight HD-SDI out. I just like the idea of bringing accessibility to folks who might be cash strapped. Watch for insight from me as we go thru the weekend conference. thanks for your feedback Laurence! so could we say it is more or less the DR and resolution of the pocket in Prores? It needs studio light! Really, but truth is, the simplicity of it just makes me want to dump the old SONYs ASAP. Enough with hidden menus. There is noise, there is no real how to work the buttons manual, so learn by trial and come out ahead in the end. It is so unique, that big screen, the ports all around the camera. I see a good future for this camera. And believe me. If BMD creates a CCU type of console, wow! Just let the operators work on image / shots and leave all the rest to a master console. We are going to be in Santa Fe next June as part of the New Media Currents Conference. I hope we will have by the a total A thru Z BMD solution. It just makes sense. Caveat time. It is an indoor camera at this point, not a Indy film acquisition device. If that helps. But boy if you need to do a indoor set with multiple cameras, this with its big brother 4K camera could change a few minds especially if a CCU type console is forth coming from BMD. If they have one already I would use it. Interesting review, very encouraging vision! If IR pollution is a problem with ND filters, Tiffan have combo IR/ND filters that work in both visible/IR areas of the spectrum so you just don’t block visible light and let proportionately more IR through as you do with “standard” ND filters. Check out their website. They are distributed in Australia. You’re seeming to say that there’s version made by tiffen that has variable IR as well as ND ? or are you saying that there is a variable ND that has a constant IR filter ? TRUE ND’s are the most technically pure or neutral ND’s I’ve used. I’m no fan of the Tiffen or Schneider in this regard either. and thanks for the information about this great camera ! Just saw a pic of the upcoming Olympus 40-150 f2.8 and thought of you as you always seem to have the coolest Olympus gear. Big lens, though judging by a pic you recently tweeted of the URSA, you aren’t deterred by unwieldy camera/lens combos. Olympus EM-1 getting 4k via firmware? Well, you were right. Should’ve known it was too good to be true. Hmmmmmmmmmmmmmm. Why do I get the feeling you know something. Got my URSA today and man is that thing HEAVY!! I’ve been playing with it now for a few hours using some fast Zeiss CP.2 glass and overall the images are looking nice. I’ve successfully shot in all the flavors and formats that is does, but can not for the life of me though figure out how to shoot at 60p and playback at 23.98! I saw all of that lovely slow motion footage you shot and wondered what your workflow is? I’ve tried adding it to a timeline that’s 23.98, but it looks AWEFUL. I’ve tried adding it to it’s native 60FPS timeline and slowing it down also with bad results. Would you mind sharing your secret so I can stop pulling my hair out please? In resolve you need to right click / control click on the frame rate of each clip in the media browser. You can then set the “playback” frame rate. Figured out how to hook up the URSA to my Steadicam today. Also did some very nice greenscreen tests. It performed beautifully. I’ll share more later. Is the URSA the same tech as the BM 4K camera? Just wondering if it has the same ISO and dynamic range issues as the 4K cinema camera or if it’s better. Ok..sounds like the same sensor and issues and I’d be surprised if it weren’t. Seems odd if they had 2 different 4K sensors. It’s too bad, the global shutter is fantastic idea, but from what I’ve read it really reduces the ISO..er ASA capability of a sensor. I wonder if the MetaBones SpeedBooster kit could help out here.. although not sure they make one for PL mount. I was thinking of getting the 4K cinema camera 4/3 mount and using the EF SpeedBooster to fit my canon EF lenses and gain the 1 stop of dynamic range it supposedly provides. Kevin the URSA uses the same 4k sensor as the Blackmagic 4k production camera. The ISO and DR are nearly identical.